The Welsh and Seattle Reign FC midfielder was awarded the honour yesterday at Buckingham Palace. As previously reported, Jess Fishlock was one of the names listed on this year's Queen's Birthday honours which were released in June and yesterday, the veteran midfielder was awarded the MBE by Prince Charles at Buckingham Palace. Jess Fishlock spoke to the official website for the Welsh national team bac in June when the announcement was first made in June. She stated that she was "proud to have received the award and to be recognized for who you are and what you do". 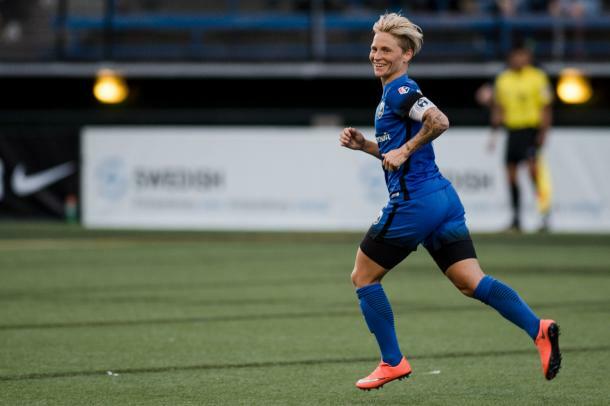 Fishlock also noted that as a soccer player, it was also great to the sport being recognised more and more as it felt that "things were going in the right direction". A wonderful - beautiful honour. Fishlock was awarded the MBE not only for her soccer exploits but also as a role model for the LGBT community. The midfielder hoped that this would help inspire others as not only do people struggle within themselves but also in society. She noted that it was important for everyone to "feel safe with who they are" and as she was gotten to the place in her life where she feels she has been the "best version of herself", she wants others to feel the same way. Jess Fishlock started playing as a young girl with Cardiff City Ladies and has not looked back since. She has played in England, the Netherlands, Australia, Scotland and Germany, and will be splitting her time between France and the United States of America this season. Fishlock currently plays with Seattle Reign FC in the National Women's Soccer League but she is currently on loan from the club with Olympique Lyonnais until the end of their season in Europe. For Wales, Fishlock has been a mainstay since she was named captain of the U19s team. She made her senior team debut against Switzerland in 2006 and in 2017, she became the first Welsh player, male or female, to reach 100 caps for her country. That occasion occurred in a 3-1 win over Northern Ireland which capped off a great day for Fishlock. Although Wales has yet to qualify for a major tournament, Fishlock remains a well-known name for those who follow the game. Her role especially at club level, has elevated her to one of the best midfielders in the game today and the MBE honours were well-deserved.